I know, they are cute, especially the speckled fawns as they frolic on my floodplain while their mothers graze nearby. But we all know how much of a challenge gardening in the southeastern piedmont region has become as our deer population has grown exponentially. When I find a treasured young tree with its bark shredded and branches broken beyond repair because a buck used it to rub the fuzz off his antlers, I admit that I am moved to contemplate Bambi-cide. Instead, I’ve spent the last quarter century devising gardening work-arounds for my five acres of green chaos. This is what I have learned. There is no such thing as a deer-proof plant, except for almost all non-native invasive exotic species. I’ve never seen evidence of deer grazing on privet, autumn olive, porcelain berry vine, Japanese honeysuckle, or Japanese Stiltgrass. The only exception to this rule in my yard is English ivy. 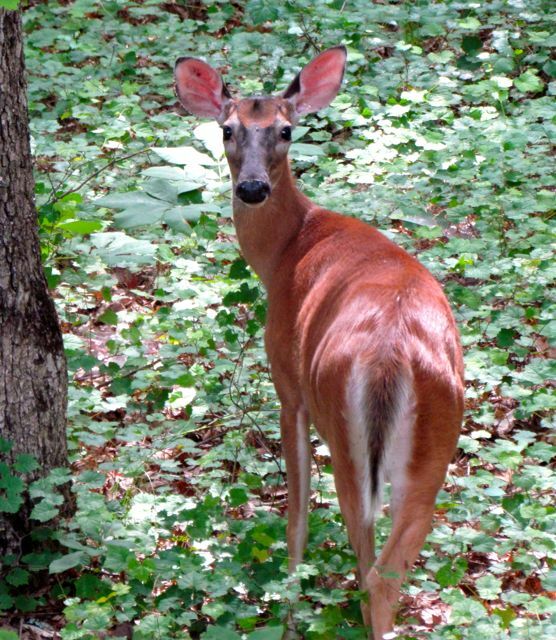 During very harsh winters, deer nibble off every green leaf on the vines crawling across the ground in my backyard. Eradicating this ivy is on my infinite gardening to-do list, but standard strategies won’t work, because an expanding stand of native Bloodroot occupies the same areas. Thus, I am delighted to have the deer slowing down the progress of the invasive English ivy, which was already here when we moved in. If I don’t protect a tree/shrub/perennial/vegetable I care about, sooner or later one or more deer will devour it. The only logic I’ve discerned is that when native food supplies are low, my local deer much more aggressively explore my plantings for dinner options. Deer will take a few bites out of any plant, just to see if it tastes good, or if they are very hungry. Every early spring before native trees and shrubs have leafed out much, one or more deer eat about a fourth of an expanding area of Mayapples. This native wildflower is so poisonous that Native Cherokees called it the Suicide Plant. I’ve never found any unexplainably dead deer lying nearby, so I assume they eat until they get stomach aches, then move on elsewhere. Fresh tracks usually mean trouble. Fertilized plants are preferentially eaten by deer. I suspect they can smell the extra nutrients. Or maybe when they’re randomly sampling plants, they find the fertilized ones taste better. A few years back, a California-based development company erased 1000 acres of beautiful forest very near my house. They replaced it with suburbs full of over-fertilized grass lawns and ornamental trees and shrubs. 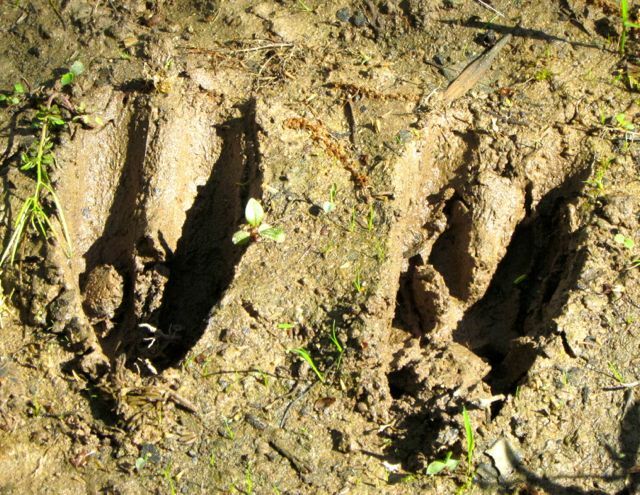 When the forest was destroyed, many of the deer that lived there moved to my land. For about two years, I routinely saw a dozen deer a day, and they ate everything. But now that the houses are up and the fertilized landscapes are in place, those deer have returned to that area to dine upon the unprotected fertilized goodies growing there. The only plants I fertilize in my yard are the ones growing in my vegetable garden, and the annual flowers I grow in the bed along my front walk. How do I protect these? Read on. 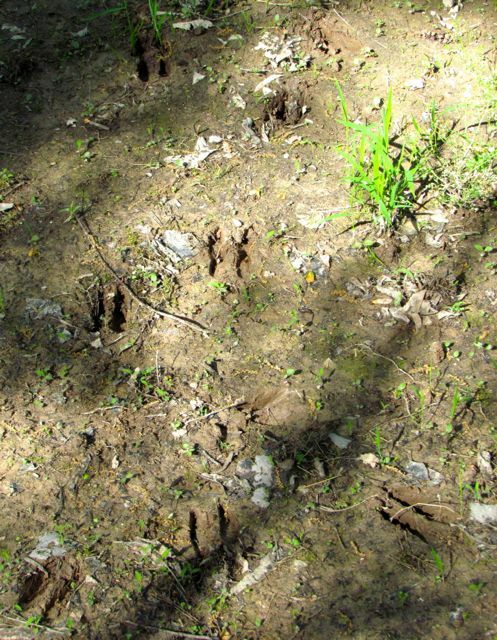 Almost certainly evidence of more than one deer. Deer-repellant sprays will deter deer predation, but you must re-apply the spray after hard rains, and you must thoroughly cover all parts of the plant. On my Oakleaf Hydrangeas in early summer when the leaves are fresh and tasty, if I miss a leaf when I spray the plants, the deer will find and eat that one. I find that I don’t have to spray all the time except during really heavy deer population years. Usually, if I spray during early to mid spring, the deer go elsewhere and find other things to eat through the summer. They usually return and start nibbling in middle to late fall, which is when I spray my hydrangeas again to ensure we get to enjoy their spectacular autumn leaf color. The noxious, but nontoxic sprays used for deer repellent also deter other plant nibblers. Cottontail rabbits won’t touch sprayed plants; neither will groundhogs. One year during a severe summer drought, deer were devouring my beautiful weeping cherry tree. The leaves of this tree turn a spectacular orange-gold in early fall, but the deer were about to make sure the tree displayed no fall leaf color at all. I thoroughly sprayed this small tree anywhere I thought the deer could reach, which was most of the tree at that time. Immediately, I noticed that another problem pest of that tree – Japanese beetles – disappeared. Evidently, they didn’t like the taste of the sprayed leaves either. I now routinely spray this tree in late spring to remind the deer to leave it alone. During big Japanese beetle plague years, I spray the tree again to deter these invasive exotic pests. Japanese beetles love grape vines too. If you’re trying to grow your own grapes and you have trouble with these pests, try spraying the foliage with one of these repellant sprays. The repellant sprays only smell bad until they dry. But you want to be very careful about how you spray. From personal experience, I encourage you to avoid windy days, especially when the wind is erratic. I also always wear gloves that I don’t mind getting rid of afterwards. Somehow, the bottles always manage to leak a bit onto my hands. If you are more adept, perhaps you can ignore this advice. You’ll find recipes for making such sprays from scratch. This is messy, stinky work, and because I only spray a few plants a few times a year, I don’t mind investing in the commercial products. For larger landscapes and especially valued plants (think vegetable garden), barriers are the only effective defense I’ve found. 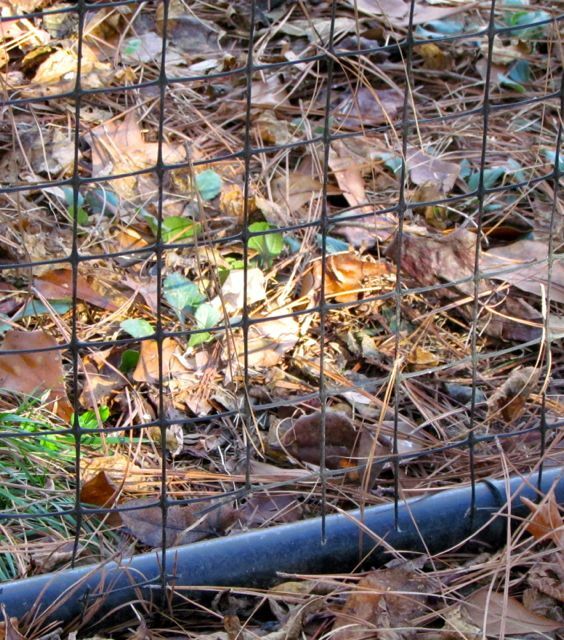 For many years, this meant surrounding all new woody plants with wire cages. This was not only ugly, but invariably the plants grew beyond the confines of the cages before I could provide a larger cage. Deer nibbled the protruding branches, growth of the overall plant was inhibited, and noxious invasive species, such as Japanese honeysuckle and Japanese stiltgrass used the cages for their own evil purposes. Finally, we invested in deer fencing. I wish we had done it sooner. A deer fence gate on my north slope garden. Deer fencing comes in several forms. 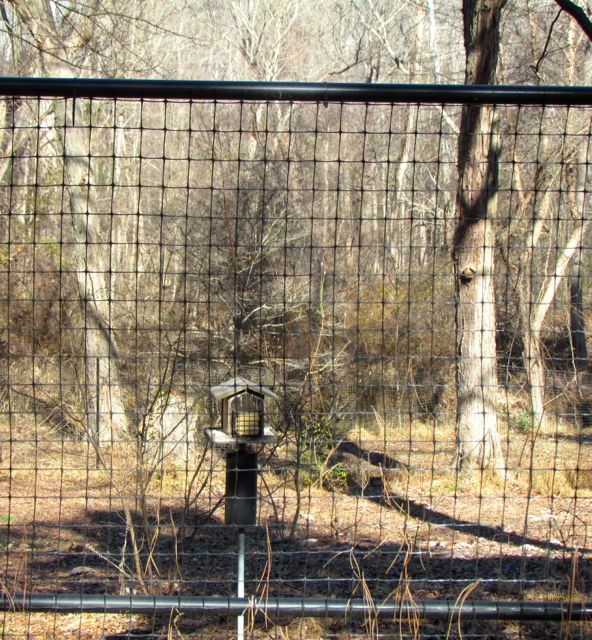 We paid a professional landscaping company to install 7-foot-tall plastic deer fencing around about an acre on the north side of our yard where I had planted most of my most treasured woodies – deciduous azaleas, deciduous magnolias, choice viburnums, Stewartias, etc. Freed from their wire cage prisons, all of the plants doubled in size in two years. I think their root systems had been growing, but their top growth had been inhibited by the cages. Once freed, they exploded. I felt like a fool for not figuring this out sooner. The company that installed our fencing built us several sturdy gates for easy access to my beauties, and for the first year, they repaired any holes that developed for free. Every winter, they offer discounts on repairs. Most of the damage to our fence – and there hasn’t been all that much – has resulted from falling branches from the large canopy trees within the enclosure. Only once did a deer try to jump the fence, which resulted in some tearing. The installation of the fence changed the regular paths the deer used to cross that part of the yard. Now that we’ve forced them to detour around the large enclosed acre, they only visit certain parts of my yard when they are very hungry and thus willing to go out of their way to seek food. Base of north-slope deer fence gate. Note how the bottom is less than an inch above the ground. We had the same company enclose the vegetable garden in plastic-coated chicken wire fencing of the same height used in the other area. 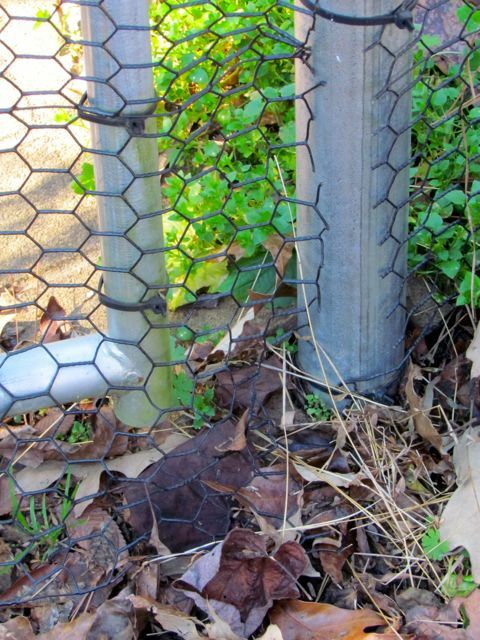 On our fence-enclosed north slope, squirrels immediately chewed holes in the plastic fencing along the bottom. We repair the holes, but the squirrels make more. We didn’t want this issue in the vegetable garden, knowing that the rabbits would happily use the squirrel-created entries for their own purposes. I am not exaggerating when I tell you that on early summer days when my spring lettuces and carrots are productive and juicy, I often spot a rabbit sitting at the garden gate, wiggling its nose wistfully at what it cannot reach. The plastic-coated chicken wire was definitely worth the higher cost for this area. 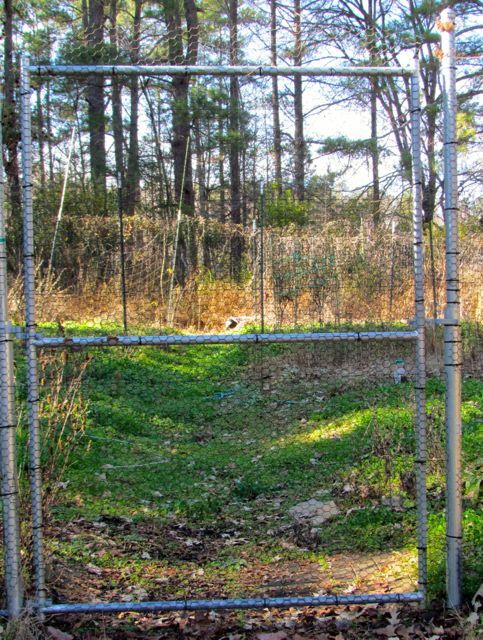 Deer fence gate to vegetable garden. Certain ornamental plants are just not worth growing in my yard, because I know that deer/rabbits/groundhogs will eat them faster than I can protect them. I’ll give you a list of those plants as well as a list of plants my deer don’t seem to favor in another post soon. This one is already too long. Close-up of base of vegetable garden gate. Note how the wire extends past the metal poles to touch the ground and also across the gap between poles, thereby deterring hungry rabbits. Have you devised other strategies that work for your garden? If so, please share these in the comment section of this post. They outnumber us, so we gardeners must stick together to thwart them! This entry was posted on January 10, 2015, 3:12 pm and is filed under Native Wildlife, piedmont gardening. You can follow any responses to this entry through RSS 2.0. You can skip to the end and leave a response. Pinging is currently not allowed. Very interesting post. I have only within the last year begun to have problems with deer. I have a “rural” residential lot that is ~1.1 acres and is adjacent to a wooded area from which the deer have begun to appear. Late in the spring this past year when returning from the beach, I noticed that something had been eating my rose bushes. As I was walking around the yard late that afternoon I saw a deer coming up out of the woods and seeing me it turned back into the woods. I have been trying to add native azaleas to my landscape and for the most part have purchased very small starter plants and grown them in pots for a couple of years before setting them out in the yard. I set out several early this past fall that were full of flower buds and was anxiously awaiting a beautiful show this spring. Several weeks ago I was walking around the yard and noticed that something had been nibbling on several of the plants that I had set out as well as some evergreen azaleas and camelias that I had recently planted. Others which were planted further away from the wooded area and closer to the street were not affected so it appears that I may have to concentrate future plantings in that area. I have a recipe for a spray and a neighbor recently told me that he had a bottle of repellent that I was welcome to use, but the main reason for wanting to grow the native azaleas and the roses is for their wonderful fragrance and I hate the thought of spraying them with something so pungent. Please continue to share any additional information or experience that you have in dealing with these beautiful creatures. Hi, Steve. You have my sympathies regarding your deer-nibbled plants. Anything evergreen, such as azaleas, camellias, and gardenias, will be devoured by deer this time of year. Especially because yours were newly planted, they probably were well-fertilized and quite tasty. I have seen camellias gnawed down to leafless nubs this time of year. By all means, spray all your evergreens as soon as you can, and re-apply after rains all winter long. You need to modify their expectations of your yard as a banquet hall. Roses are one of deer’s favorite food groups. If you don’t enclose them inside a protective barrier, you’re going to be forced to spray if you want to see any flowers at all. The same goes for those fat flower buds on the deciduous azaleas. I understand your concern about marring the fragrance of these wonderful flowers. However, I’ve found that I can’t really smell the spray after it has dried, and I believe the fragrance of a rose or a deciduous azalea would easily outdo any lingering scent from the spray, especially outdoors. If you’re cutting roses for indoor arrangements, you’re likely cutting them when the buds are mostly still closed, yes? If so, you could try gently immersing the buds in tepid water to rinse off any lingering spray, just to be sure the fragrance of the flowers is untainted. As for noting that plants closer to your street seem to be unaffected, I wish I could tell you I thought they were safe. On my once-rural, now-suburban road, I routinely see deer grazing on the edge of the road. I suspect the only reason they haven’t eaten your plants nearer the road is because they haven’t been hungry enough to venture that far yet. But when we get a February cold spell, I wouldn’t be surprised to see them try those plants. I advise you to spray them now before they are nibbled. I’ll be sharing some of my experiences with specific plants and deer soon, so stay tuned.